We are not 7 weeks into the EPL season and FPL Draft isn’t holding the sort of thrill and excitement I thought it would. Initially, I felt there could be some interesting aspects to the game. Considering I come from a fantasy (NFL) football background of 38 years, this draft game did show some early promise. To date, I am just not impressed. Maybe my thoughts would be different if the 8-team league I play in were local friends and not some unknown Internet alias. That said, I climbed into 2nd place in my draft league after a strong-ish showing this past weekend scoring 44 points, which was second highest in the league. 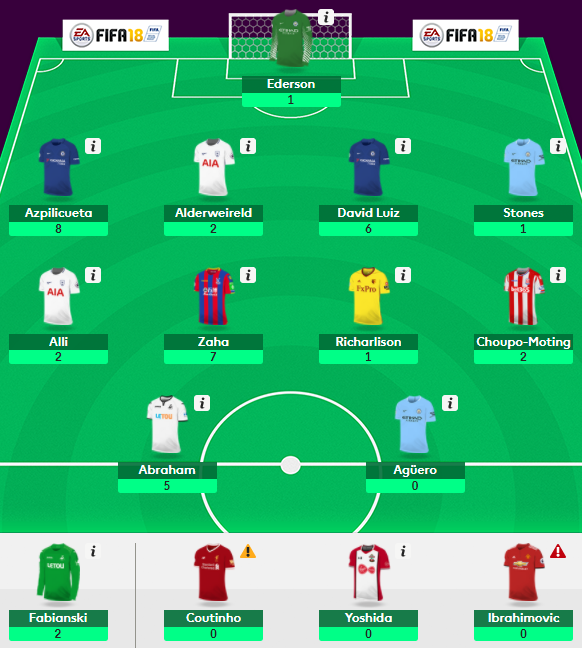 After 7 weeks I have scored 305 points, which is now 36 points off the top, which I expect to take in the coming weeks after the international break. Its interesting to not as we get further along in the season, the more transactions I am taking through the week. 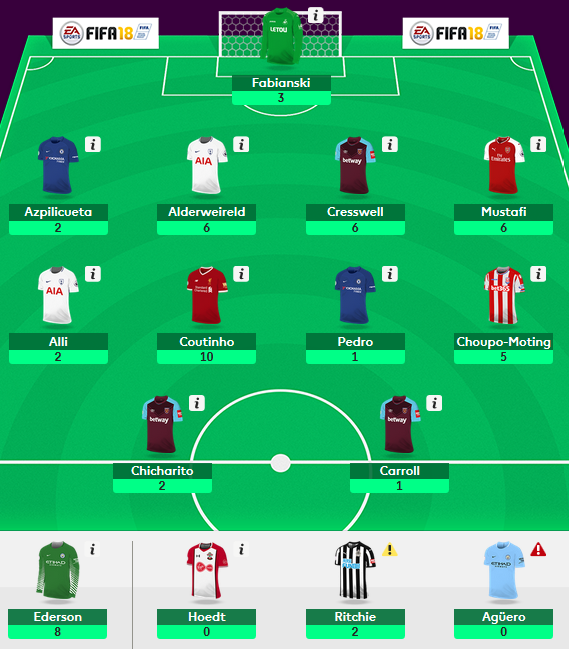 I stated the week with 3 waiver claims; Hoedt, Chicharito, Mustafi. 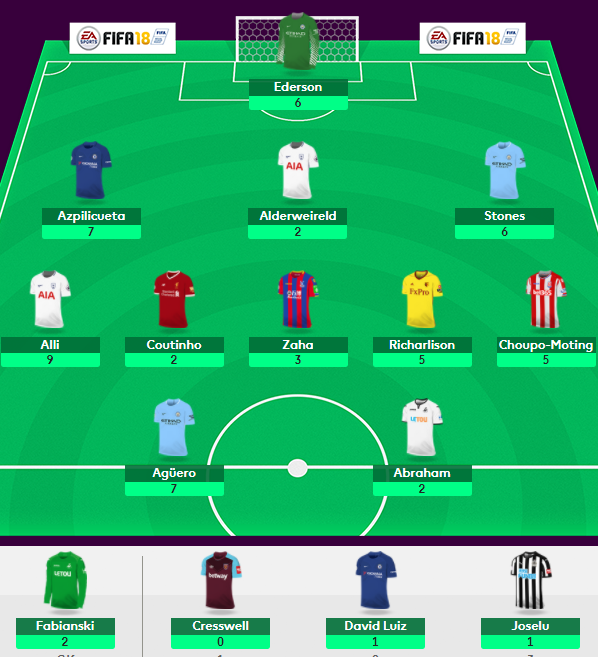 I ended up getting all three of the on Thursday and dropped Mendy (inj), Benteke (inj) and Lascelles. But that wasn’t enough, the merry-go-round continued into Friday, adding Niasse, Richarlison, A. Carroll, Cresswell and Choupo-Moting. In the end Richarlison and Niasse, along with Stones, Jese and Joselu were dropped. 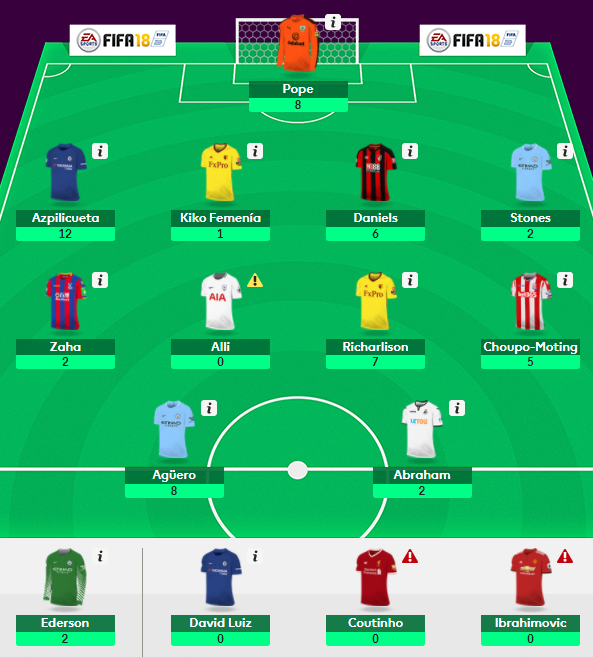 On the week I started Fabianski in goal over Ederson because of the match up. Only a late goal by West Ham denied Fabianski his 4th clean sheet on the season, but he did scoop up a bonus point. Defensively, my squad is sound, as I started a 5-4-1, tripling up on West Ham. Mustafi, Cresswell, Alderweireld and Azpilicueta combined for 20 points, with only “Dave” not keeping a clean sheet in a 1-0 loss to Man City. My fifth starter was Hoedt, who was benched in favor of Van Dijk, which mean Pedro was slotted in. The midfield looks good on paper, but Alli continues to struggle, posting another no return, while Coutinho continues to look good in the Liverpool midfield with another goal and 10 points. The new boy, Choupo-Moting (5 points) was a late add over Richarlison, but he secured an assist, his first of the season. Pedro was the first player on the bench and I had no intention of starting him against Man City but felt he had a better chance than Ritchie to gain points. I was wrong, Ritchie scored 2, Pedro, just 1 point. 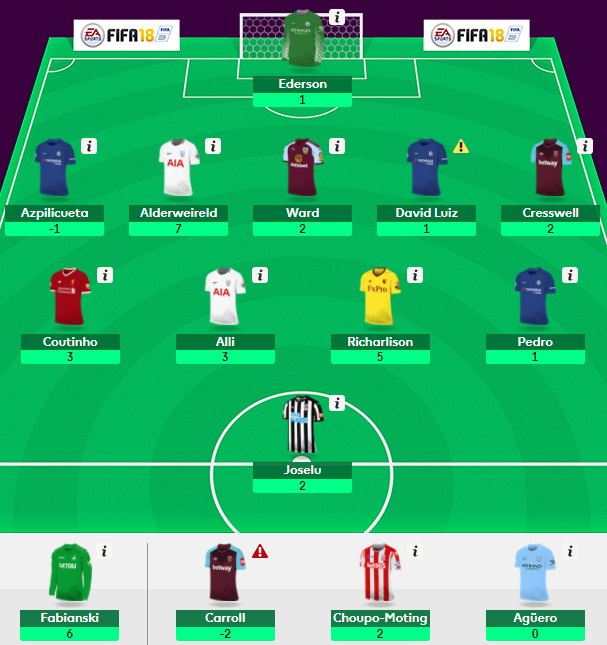 With Aguero now sidelined and down a bench player, I moved both my struggling forwards and doubled up on West Ham; Hernandez and Carroll. That move failed to pay off as they combined for just 3 points. The Hammers still have some favorable fixtures; bur/BHA/cry out of the break, but I am not sure if they will retain their starting spots or not. With 2 weeks to plan and make moves, the waiver wire is open until Friday, October 13, which means we have a lot of waiting to do. I have put in a claim for Fellaini, even though they face Liverpool out of the break, followed by Huddersfield. The other wire claim I put in is for David Luiz, somewhat surprised he is out there, as it SHOULD be a Chelsea CS when they come out of the break against Palace.